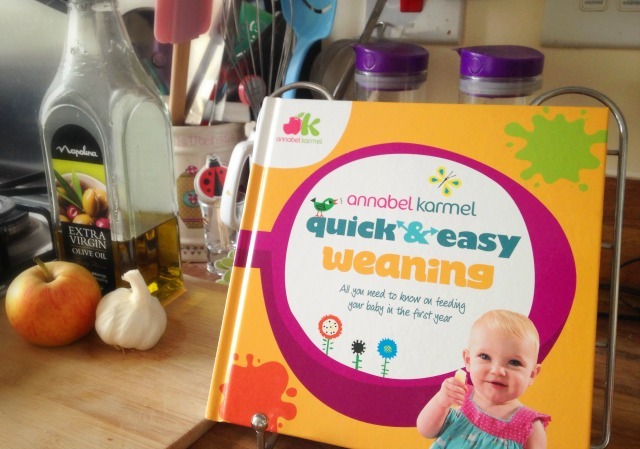 A couple of months ago we were sent the brand new Annabel Karmel book, Quick & Easy Weaning. I used Annabel Karmel books when weaning first time round so I was eager to give this one a try with the twins. In my opinion you can’t go wrong with Annabel Karmel; like her other books the book starts off with plenty of information for parents about weaning. It covers when to start, what to try at each stage, first tastes, allergy advice, routines, food to avoid, cooking and storing advice and equipment. What I love about Annabel’s books are the meal planners for each stage so I was glad to see that these were still included. I find these a great starting point for fitting solid feeds into your babies day and they can be easily adapted to suit your own routine. I’ve used them with all three of my children and they have been perfect for us. I use the book nearly every day and always have it to hand when I am doing the food shop. I can usually find something it in to make once I’ve had a root around in the fridge and so many of the meals can be frozen which is ideal for busy families. I like the layout of this book more than the older version, it feels fresh and uncluttered and the photos are lovely (I really like good photography in recipe books!) There isn’t as much writing as my old book, it gets straight to the point which I like. The recipes cover all food groups and give plenty of ideas to get you started. Most of them have other options for what you could add or substitute if you haven’t got the ingredients to hand and they all say how many portions each recipe makes. I’ve been very lucky with my twins and they will eat everything I put in front of them so it has been a joy to cook for them using this book. I loved having this book to hand as even though we’ve been through it before you still need a little refresher and some new ideas to give you confidence throughout weaning. It was good to read the information and remind myself of what they can’t eat and I used the meal planners right from the start. Overall I think this book is an ideal companion for the start of weaning and will see you right through the 12 months and many of the recipes will stick around beyond that. 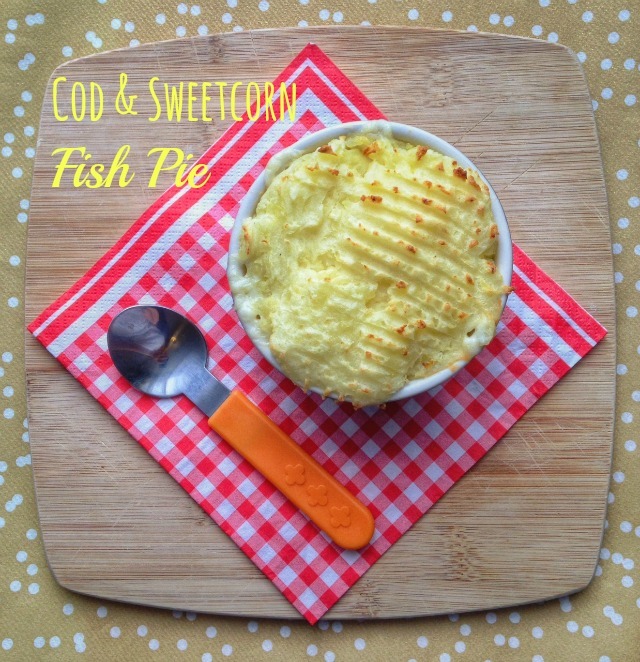 I thought I’d share one my twin’s favourites, Cod & Sweetcorn Fish Pies. I don’t eat fish so I’m not very confident at cooking it but is is so important for a babies diet, full of good stuff! I find these very simple to make and the boys go mad for them. Boil the potaotes for 15-20 minutes until sodt. Drain then mash with a little butter and milk, set aside. Melt the butter in a saucepan, add the onion and fry for 5 mins. Add the flour and mix then whisk in the milk to make a smooth sauce. Bring to the boil then simmer for 2 minutes, add the cheese and chives then stir in the cod and sweetcorn. 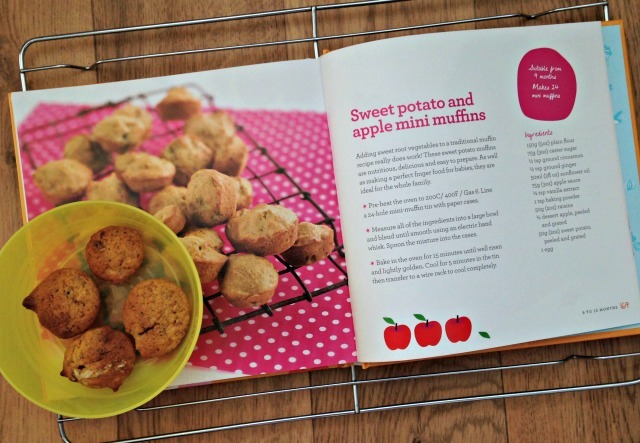 Disclaimer – I was sent Annabel Karmel Quick & Easy Weaning to review. All thoughts and opinions are my own. We actually eat an AK spag bol recipe as preference over a standard grown up one now! This actually sounds like a great idea even for my 3 year old because she is still so picky with food. Those mini muffins are an amazing idea that is so simple and yet I’ve never thought of.